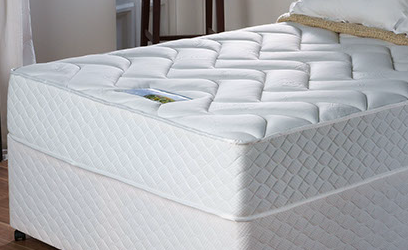 An open-coil mattress is comprised of a set of springs that are interlinked with each other to make a complete mattress. This system is traditionally considered to be part of the economy to mid-range market, and is best suited to children, guest rooms, and those on a tight budget, although the top of the range will make a robust everyday bed. Because the springs are all joined, a disparity in weight means that any movement on the mattress is felt all over. There is also the possibility of a ‘dip’ effect being created in the middle of the bed if weight is not spread evenly, meaning if one person’s weight pushes down on the centre of the mattress, the other person will slide into the ‘dip’ in the middle. This system is not recommended for people with hip or shoulder problems, due to the fact that the hip and shoulder are put under pressure when lying on your side, and the relative lack of support from this kind of mattress can result in discomfort. These mattresses have springs that are not joined together, but are instead set in place in fabric pockets. The advantage of this system is that movement on the mattress is absorbed by local springs, rather than the entire mattress. This means that movement and weight disparity are less likely to have an effect on anyone else using the mattress. The independent nature of the pocket springs also gives a greater degree of moulding to the body, and therefore provides increased comfort. 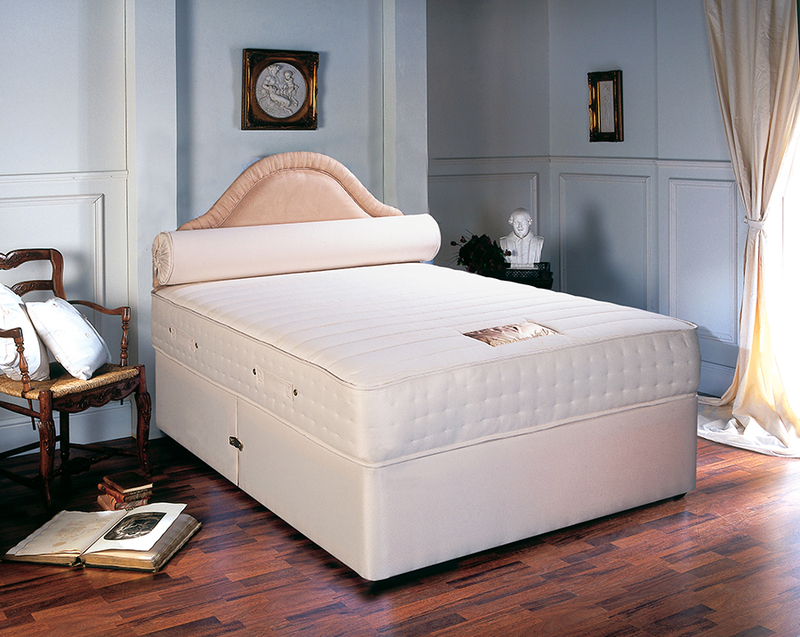 Pocket sprung mattresses are considered to be part of the mid-range to high-end market. N.B. The number of springs on the label is usually the number in a Kingsize mattress. Spring counts of 1000 and over are considered to be of high quality. A bedstead is a frame in which the mattress sits, and usually has flat slats or concave slats as a base. Frames can have either high or low foot ends, and low foot ends are popular for being less obtrusive whilst sleeping. Centre beams and legs are essential under most bedsteads to give extra durability. Budget frames are most commonly made of pine and metal. The middle and top of the range are made of hardwoods such as oak, and wrought iron. This is a bed that consists of a mattress on top of a box base made from timber, and covered in a fabric. Most bases are in two halves that are joined on delivery, and take up less room than bedsteads as they sit flush under the mattress. Divans can have a variety of in-built storage solutions, such as 2 drawers, 4 drawers, a large end drawer, 2 half and 2 large continental drawers, or a solid base with no drawer. N.B. Bases with castors are usually 16" in height without the mattress. The total height with mattress is on average 26". This is elasticated foam that retains its shape after pressure has been applied to it. Unlike non-elastic fillings, memory foam does not compact or settle, and as such these mattresses do not require turning. Rotating the mattress is all that is required for its upkeep. Memory foam mattresses are recommended for those with shoulder or hip complaints, as the supportive nature of the foam is ideal for absorbing pressure at these points. We also stock mattresses that have a memory foam top above a spring system, rather than foam all the way through, which allows a better circulation of air through the mattress, reducing the build-up of heat during sleeping hours. Shallow bases are similar to a divan base, but sit lower, and have no drawers, and instead of sitting on castors, typically have stationary screw-in legs. Those who find modern divan bases too high may prefer a shallow base. Cotton, wool, cashmere, silk, bamboo, mohair, and latex (formed from tree sap) are the most common natural fillings used in mattresses, and are often preferred to synthetic fillings as they allow the mattress to breathe, thereby reducing heat build-up .